Léger Félicité Sonthonax (also Santhonax; Kreyòl: Santonaks) (March 17, 1763 Oyonnax, Ain, France - July 28, 1818 Oyonnax, Ain) - French Commissioner who arrived in Saint-Domingue in late 1792 1 and served as the French colony's Commissioner (at the time replacing the title Governor-General as the highest office) from January 2, 1793 - June 19, 1793 and from May 11, 1796 to Aug 24, 1797. Sonthonax was affiliated with the Société des Amis des Noirs, a Paris based anti-slavery society. Note 1: Léger Félicité Sonthonax, arrives in the Le Cap together with Commissioners Polverel and Ailhaud on board of the ship America on September 17, 1792. Note 2: See also: François Galbaud du Fort - Contains a paragraph on Sontonax's clash with Galbaud. Sonthonax Broadside 1793 - Sonthonax defending his decree freeing the slaves. 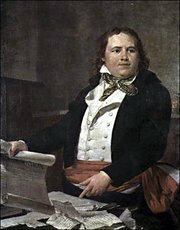 Philibert François Rouxel de Blanchelande - Sonthonax had Blanchelande, a governor of saint-Domingue, deported in September of 1792. Napoléon decree re-establishing slavery in the French colonies (French) - From May of 1802. Memoir of transactions that took place in St. Domingo - Book by Marcus Rainsford. This page was last modified on 8 September 2009, at 11:22.